SELDOM has the general feeling of the town shown such sympathy and regret as when the news spread that DR. THOMAS was no more. He died about 6 o’clock on the morning of the 1st instant, at his residence, 58, Pendre, in this town, in his 49th year. It is only three months since that the Doctor married, and we are sure the condolence of the whole town is with his widow in her bereavement. It was known that the Doctor had been seriously ill, and the worst fears were entertained; but when it was announced that he had died, so acute was the general feeling, that a gap seemed to have been made in our domestic circle, and a still wider influence had been taken from public events connected with the town. Dr. Thomas in his professional, public, and private capacity, was so well known and esteemed that, perhaps, a brief sketch of his career may not be unacceptable. John Thomas was born in Cardigan, March 14, 1831. His father was a prominent man in town, and held a seat in the Council for many years. The boyhood of the Doctor was passed in Cardigan, and he prided in calling him self a “Cardigan boy.” He went to the Cardigan Grammar School till he was 15 years of age. At that time he, like other boys, desired to go to sea, for it was thought by boys then that nobody could be a man until he had been a sailor. We can imagine the Doctor, a plucky boy, captivated by tales of adventure and danger, saying to himself, “I must be a sailor, see the world for myself, and be a man.” When at sea, we have it on the best authority, he early showed that natural aptitude and quickness of mental power which was his characteristic in after life. The Doctor was on sea for six years, and was in several ships; his voyages were chiefly coast-wise, and in the Mediterranean and American trades. In every ship he sailed he was conspicuous for his sound nautical knowledge; and we have been assured by a thorough nautical man that, had he followed seafaring life, he would have been as eminent a ship-master as he was a surgeon. The early ability of the Doctor soon manifested itself. It is related how, when sailing in a vessel belonging to the North of England, the captain and the mate being unable through sickness to take charge of the vessel, the Doctor, who was then acting as second mate, had to take the whole management upon himself, and sailed her with such skill that he received the praise of all on board, and was highly complimented by the owners. His father died while he was at sea, and his mother also died while he was on his last voyage. At the age of 21 his circumstances were such as not to require him to go to sea again. He then determined to entered the medical profession, and apprenticed himself to Dr. Bevan for 5 years. In the latter part of his apprenticeship he went to London, and became a student at St. Bartholomews. Here he soon distinguished himself in various subjects, and gained the chief prize for Anatomy. He married first in 1854, and was accompanied by his wife to London, who was with him throughout his career at the hospital. In a short time the public found out his merits, and elected him to the Town Council, and he soon became the leading spirit of the Liberal party in the town and neighbourhood, remaining a member of that board without intermission for about 20 years, He obtained every honour possible to be shown by his townsmen, and was an Alderman, Mayor, Magistrate, and Chairman of the School Board. He filled the office of Mayor in all three years—twice in succession, and once for a single year. The Lord Lieutenant of the County offered to secure the Dr. a place on the county magistrates’ bench, but he declined the honour. As a Justice of the Peace his colleagues speak as to his strict integrity and impartiality. He was among the foremost in carrying out the Education Act of 1870, and was appointed chairman of the school board on its formation, which he held till his death. He was one of the first to support the Rifle Corps movement when it first started, and remained in the corps as surgeon during his life. He was a consistent member of the Calvinistic Methodist connexion, a staunch Nonconformist, and as a politician an unflinching Liberal, but always respected the opinions of others in politics and religion. His integrity is unimpeached, and the whole characteristic of his life was a plain straightforwardness. We may say of his character, it was one of invincible firmness. He used to say that, if a young man made up his mind to pass an examination, and put his whole soul into his study, it was impossible for him to fail. As a speaker in public he was terse, forcible, and clear, and generally pitched his voice in a high key—a habit probably contracted when at sea. As to public speaking, he used to say, Never mind the words, be in earnest, and you will speak with effect.” To illustrate how he was held in admiration by his friends and opponents in political affairs, when his name was mentioned in the Council on the morning of his death, words could not be found to speak of their departed colleague, the whole Council gave way to tears—an eloquent tribute of the admiration of those who differed from him in opinion, as well as a genuine expression of the love of his friends. The town and neighbourhood have sustained a heavy loss in his death. We may sum the general character of the Doctor in a few words. He was a man of great natural ability, of unwavering adherence to what he held to be true, of honesty of purpose, and had such a genial, open straightforwardness, that he won the hearts of all who came in contact with him. We have known the Doctor nearly 20 years, and have given this slight sketch of his career with the de- sire of weaving, if we can, a chaplet of “forget-me- nots” round the sacred memory of one whom we respected and loved. In 1881 the following persons lived here: No 57: Thomas Thomas, 52, grocer; Elizabeth Thomas, 37, his daughter; and William Thomas, 29, son. No 58: Ellen Thomas, 33, annuitant; and Margaret Davies, 18, servant. In 1884 Mrs. Thomas lived at No. 58. In 1891 Hannah Thomas, 78, widow, grocer, lived here with her grand-daughter, Maggie Hazzelby, 15. 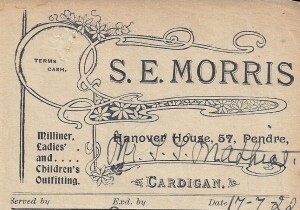 Morris opened a milliner’s shop at Hanover House – No 57. 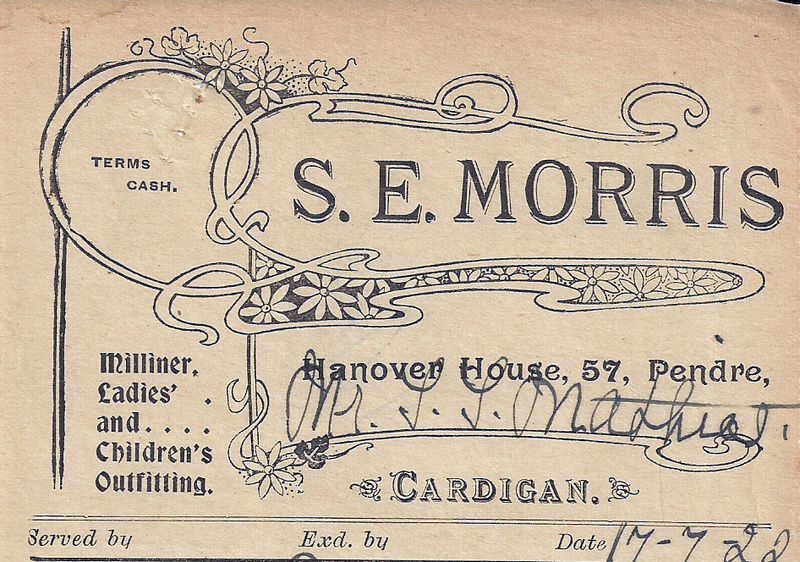 In 1905-27 Miss S. E. Morris, milliner, traded here. On 4th July 1905 ironmonger David Williams who had traded here, died aged 44. In March 1907 Nos. 57 & 58 was advertised for sale. In 1910 Sarah Elizabeth Morris and Edith Blanch Morris lived here. In 1911 the following persons lived here: Sarah Morris, 55, milliner; and Edith Morris, 35, her sister, assistant. In September 1913 the old railings in front of No 58 were removed. They had been made at Forge Cych Ironworks, Boncath. On 2nd December 1919 Miss Sarah Elizabeth Morris of Hanover House died aged 64. She was the second daughter of the late David Morris, draper, of Bridge Street. 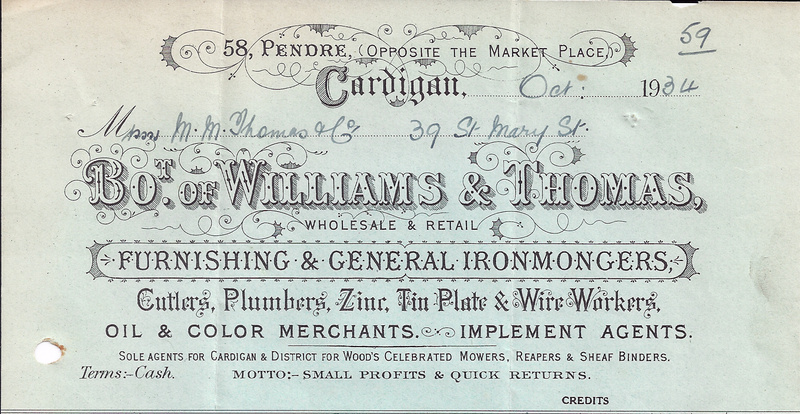 On 17th April 1921 James Thomas, ironmonger of ‘Williams & Thomas’, died aged 59. On 10th February 1925 Henry Williams of No. 58 Pendre, son of John Williams, Felingynllo, married Catherine Morris of Central Cafe, Pendre. On 5th December 1933 Idris Thomas of this address married Miss Gwyneth Hopkins who worked in the Post Office, High Street. In 1933-40 Idris Thomas, ironmonger, lived here. On 31st March 1938 David John Griffiths of Hanover House died aged 51. He was a son of John & Mary Griffiths of Priory Street. In 1940 Mr. & Mrs. Henry Williams and Mr. & Mrs. Picton Davies lived here. In 1941 Glyn Jones lived here. Tom Jones lived here in 1942. In November 1942 3rd Engineer Glyn Jones, son of Tom Jones, was killed by a torpedo strike. In 1949 Rees Davies lived at 57. In 1950 the Cardiganshire Nursing Association had an office here. 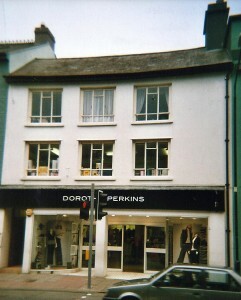 D. Morris Davies lived at No. 57 in 1953. On 26th June 1964 “The Mercantile Shop” opened here. In May 1965 the ‘Commercial Union Assurance Group’ opened an office here, still trading in 1976. ‘The Mercantile Shop’ traded here in 1964-85 (including china goods). In 1984-89 ‘Teifi Insurance Services’ occupied the first floor. In 1994-2001 ‘Stead & Simpson’s’ shoe shop had a branch here. From 1994 ‘Swallow Office Supplies’ was located on the first floor. On 15th February 2001 ‘Dorothy Perkins’ opened a branch here. 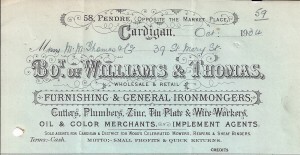 List of Voters – Cardigan 25/07/1910. Cardigan County Agricultural Show, Islwyn & Betty Griffiths 2004.